When you purchase a new car, you want to do everything you can to preserve its pristine look and that wonderful “new car” smell. So we can’t blame you for jumping to gun and relying on the manufacturer car seat covers. The problem is that car dealers can make a killing through upgrades and selling accessories to you. The manufacturer car seat covers also might not necessarily protect your car seats in the way you hope they will. Here are some drawbacks to using manufacturer car seat covers. The main reason you would want to purchase car seat covers is to protect your car’s seats. 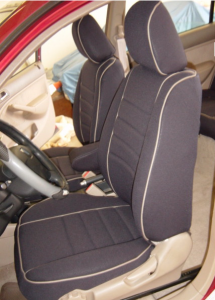 The goal is prevent dirt, sand, friction, and liquids from ruining the fabric or leather of the car’s seat. First of all, good for you for preemptively protecting your car’s overall value. The question now becomes, does the manufacturer provide high enough quality seat cover protection? While they may make great vehicles, protecting material is not necessarily their core focus. That is where we come in. Our goal is to protect your seats from everyday uses and mishaps. The neoprene material we use in our car seat covers serves as optimal protection from spills, dirt, sand, sweat, the sun’s UV rays, and more. We’re not saying that every manufacturer’s car seat covers are bad, we’re just saying that this is our specialty so you know you are getting quality car seat protection. Another drawback to using a manufacturer car seat cover is that it might be a one-size-fits-all car seat cover. This makes it incredibly easy from a production standpoint. The vehicle manufacturer can make one size of a car seat cover that can be somewhat adjusted to fit a number of their make and models seats. The problem with this is that it is not foolproof protection. Anytime there is a one-size-fits-all solution, there is usually some weak spots. The car seat cover might be too large, meaning there can be some gaps in protection. Our Wet Okole car seat covers, on the other hand, are custom-sized for every year, make, and model. This means that your car seat cover is essentially a skin for your car’s seats, offering optimal protection. A final drawback to using a manufacturer car seat cover is the options. Typically, manufacturers just don’t provide that many options in terms of colors or style. We offer a ton of options! We have options for single-color car seat covers, accent colors, patterns, and even decals! We can almost guarantee you will find the perfect design to match your taste.